Is Cloud Hosting Secure Enough For A Website? Demand for web hosting is growing more and more and web hosting companies offer different packages with different features and options, however in an overview, you can see that offered resources are too outdated or too rich. At this moment, it is hard to find a perfect hosting packaged adapted to your needs. Companies and clients consider this a big disadvantage that brings financial deficit. Cloud hosting is the perfect solution for clients that want an exact number of resources such as space, traffic, bandwidth, processor, RAM to optimize one or more websites, but also for web hosting companies that want to use their own technologies and servers at maximum performance. Is cloud hosting secure enough for a website? You can find the answer in the following explanation. In present, the notion of cloud computing covers everything that is related with web host service delivery. This services fall into three categories: infrastructure services (IaaS), platforms (PaaS) and software (SaaS). If we are looking at cloud hosting less technical, as the sky has more clouds, so in a data center are more servers. Each cloud (server in our case) has its own features, and the principle whereby several servers act as one is called Cloud hosting. Due to a Cloud software and dozens of servers at disposal, every data center can optimize its computing power, but also its income and clients can receive resources they really want. Cloud hosting services have three major features that makes them different from traditional web hosting: they are sold only at customers request, they are flexible (user can take use of it anytime at the resource level it is needed) and it is fully managed by the service provider. Cloud hosting services can be public or private. Public Cloud services can be sold to everyone on the internet, for example EBay, Amazon, Facebook, Steam and so on. Instead private services are data-centers or networks used only by a small number of clients such as the personal of a one company. What Can You Get From Cloud Hosting? The primary advantage of Cloud hosting is that users have the possibility to pay a fixed price for limited resources or a customized price adapted to their website’s requirements. The time when everyone is paying the same prices for web hosting is over; now everyone can choose to pay as much as they use with the use of cloud hosting. This is happening because everyone can easily make a request with what they want and they also can modify the order as they want in a few clicks, in a short time without any headaches, meaning flexibility at level of resources. With cloud hosting you can achieve an better uptime. If on a normal servers, all services (apache, mysql, imap) are running on the same machine, Cloud hosting assigns these services separately on each server, depending the need of clients. In this case, the speed of services is increased. For example, if there are 50 servers connected in Cloud, these will be programmed to run specific services. 2-3 servers will run the e-mail service, 30 servers will run the apache service so in the end each server will have well defined tasks and in case of some internal problems they will not shutdown together, maintaining services active. Connectivity is well made in Cloud hosting. A good web hosting company offers you eXploit Scanner, ModSecurity, Web Application Firewall, Antivirus, Antispam, Backup, ConfigServer Security & Firewall, CageFs Hacker Protection for you cloud hosting package. Those are the following deterrent controls that are intended to reduce attacks on a cloud system, preventive controls that strengthen the system against incidents, generally by reducing or even eliminating vulnerabilities, detective controls that are intended to detect and react appropriately to any incidents that occur and corrective controls that reduce the consequences of an incident, by limiting the damage. Also there are different security measures taken for a cloud hosting such as identity management that control access to information and computing resources; physical security that secures IT hardware such as routers, servers and cables against unauthorized access, theft fires, floods, interference; personnel security that provides para- and post-employment activities such as security screening potential recruits, security awareness and training programs; availability that offers access to the cloud every time, application security that ensures that applications available as a service via the cloud(SaaS) are secure and privacy that ensures that all critical data (social number, ID card, credit card numbers) are masked or encrypted for unauthorized users. So, Is Cloud Hosting Secure Enough For A Website? The answers is yes. You can see yourself the above lists of different cloud security controls and security measures to keep your data safe and private. 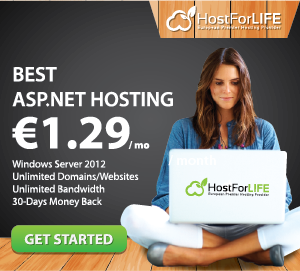 HostForLIFE.eu offers you cheap ASP.NET cloud hosting packages to fit any need. Its prices start from €3.49 monthly if you pay in advance on a year. More info click here.